In this new series of ‘Watch of the Month’ I will select a watch (from the collection of Horloge Platform Nederland) that is special, limited, ackward, collectible or just nice 🙂 Like the name of the category already says, I will try to do this monthly.. The first watch I selected is a Movado Elliptica. I noticed it in one of the displays in the watch shop in The Hague and reminded me of the Omega Seamaster Bullhead, with the crown at ’12’. I also believe Seiko has made a few of these ‘bullhead’ models. 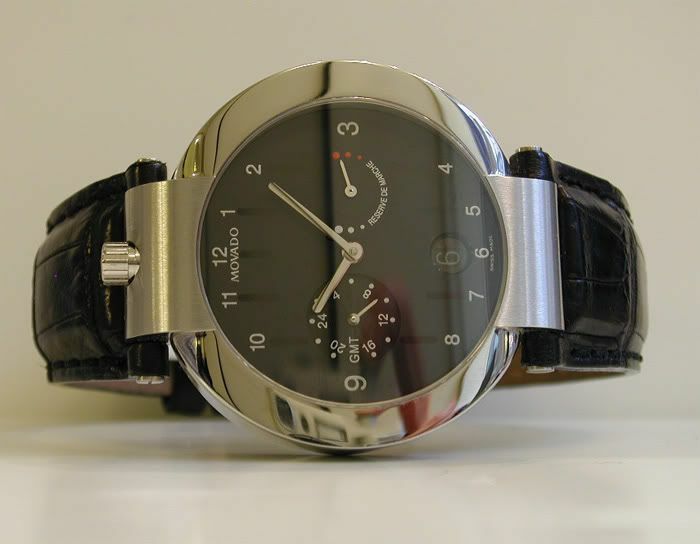 This Movado model is ofcourse an extent of the famous ‘Museum’ watch. So despite the odd shaped case and busy dial, it still has the Movado flavour. The case material is stainless steel, with both polished and brushed elements. The inner work of the watch is a Swiss mechanical automatic movement, modular built-up (ETA with a Dubois Depraz module). The dial shows that this watch features extra timezone functionality (GMT) and has a power reserve indicator. Ofcourse, this watch belongs on a black genuine alligator strap. One of the questions I asked myself is, who would wear such a watch? The shape and look is quite out spoken and probably does not fit everyone’s taste. This watch will perfectly suit the wrist of a designer, architect or editor of a magazine (like Wallpaper* for example). Production year of this particular watch is 2005. Watch comes new in box (including all the papers) for 2.950 Euro (list price is 4.060 Euro).